Automatic Electric Gates from PS Engineering in Ballymoney, Northern Ireland provide the perfect solution to keep your home and property secure. When PS Engineering fit automatic gates it is a quick and easy process. PS Engineering can manufacture gates as per your request, for a new property, to match existing railings or gates. We can also retrofit an automatic system to exiting gates. Here are a few pictures which show the automatic electric gate system installed at a domestic house. 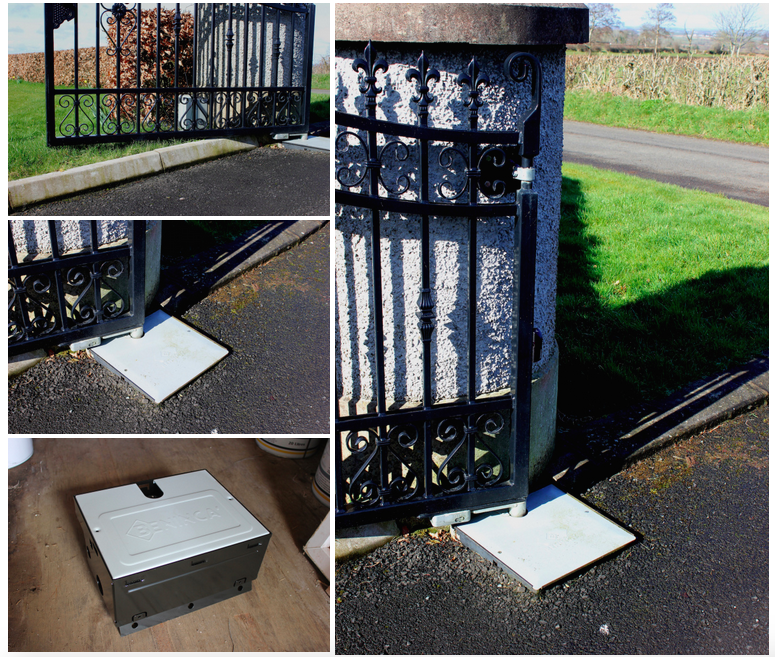 The workings fit snuggly underneath the gate and leave no unsightly or dangerous cables or up stands. PS Engineering are a steel fabrication company who design, manufacture and fit gates, railings and fire escapes. Our products are designed to look great and to stand the test of time. If you have added and entrance to your property and require new gates which match in with what is already there then just give us a call and we can see how we can help you. Once you gate has been designed to your satisfaction it is manufacturer in Ballymoney, Northern Ireland and then it can be powder coated to give it a durable and aesthetically pleasing finish. To find out more about Automatic Gates from PS Engineering in Northern Ireland give u s a call on 07739715754.